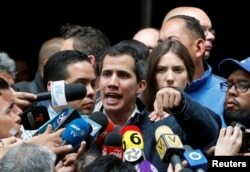 Venezuela's self-declared interim leader Juan Guaido speaks to supporters in a public plaza in Las Mercedes neighborhood of Caracas, Venezuela, Jan. 26, 2019. First, Guaido wants Venezuelans to mount a peaceful, two-hour, mid-day protest Wednesday "to demand that the armed forces side with the people." On Saturday, Guaido wants his supporters "in every corner" of the nation and around the globe to take to the streets, a move that coincides with the European Union deadline for announcing a new election. Opposition followers -- some shouting "Soldier friend, you're the only one missing" -- handed out leaflets describing the amnesty plans at military and police posts. 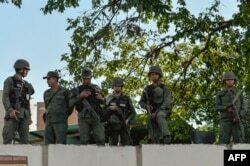 Maduro said he wants peace, But he announced more military games next month which he says will be "the most important in the history of Venezuela." ​U.S. Secretary of State Mike Pompeo told members of the U.N. Security Council Saturday to "pick a side" in Venezuela. He called the Maduro regime an "illegitimate Mafia state" and criticized countries who support him, including Russia, China, Iran, and Cuba.